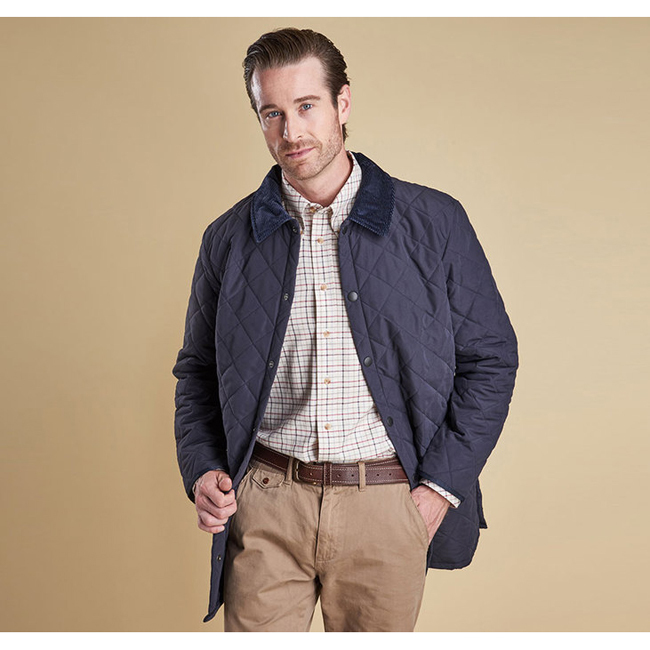 The Eskdale is a men's quilted jacket with a longer length and relaxed fit, ideal for wearing over a sports jacket. As this is a relaxed fitting jacket, we would advise purchasing the next size down than you would normally choose if you don't wish to wear over a sports jacket.Constructed in Barbour's lightweight microfibre quilt with polyester wadding for reliable warmth and insulation, this traditionally tailored jacket has timeless appeal and is a true winter faithful. Robust stud fastenings protect from the wind and rain, and two side vents with stud fastenings ensure ease of movement.An authentic detail of iconic Barbour jackets, the Eskdale's smart sit-down corduroy collar can also be raised to protect the face and throat, with a super-soft feel against the skin. Two large patch pockets are generously proportioned with plenty of room to keep essentials close at hand, while a zipped inner security pocket helps to safeguard valuables. Available in four wearable colours, with contrast Barbour embroidery to the pocket. This was for my son. He likes the jacket.